MITZPE RAMON, ISRAEL — Today my friend Yoav Avni (Geological Survey of Israel) and I returned to Makhtesh Gadol to pursue a project with Subunit 65 of the Matmor Formation (Callovian, Middle Jurassic). You may recall this limestone contains an extraordinary bedding plane of fossils preserved in near-life positions (as seen in a recent Fossil of the Week entry). 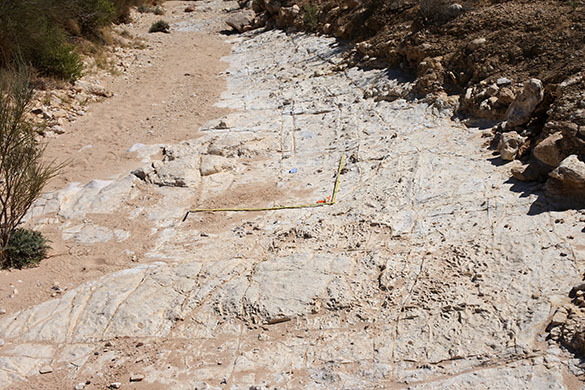 Yoav’s job was to find additional exposures of this subunit in the area; mine was to map the distribution of fossils on the bedding plane. This area of the makhtesh, by the way, is called “Meredith’s Section” after IS student Meredith Sharpe, who did splendid work here. 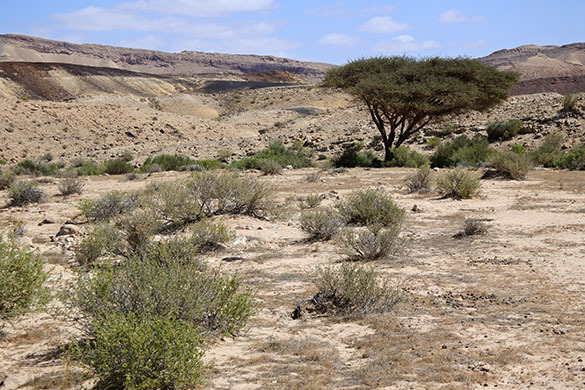 The acacia tree above is our traditional lunch spot (when the camels aren’t using it). 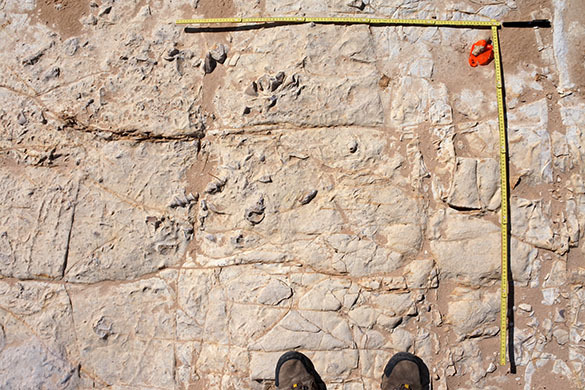 This is the bedding plane of Subunit 65. I went over every square centimeter of it photographically mapping and detailing it with a square-meter quadrat. It was hot work, and a bit of drudgery compared to the previous days of exploring new exposures. This is a typical quadrat, complete with my boot toes. I took 41 quadrat photos like this, and then detailed the fossils within and their positions. In the meantime, Yoav wandered the hills and found many excellent exposures of the same unit, although none with a bedding plane like this. We will be able to compare the fossils in the “traditional” exposures with what we see here. That’s pretty much it for my day in the desert!